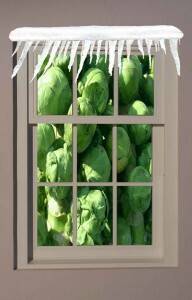 As Christmas is now less than a week away, you should start considering getting the Christmas vegetables. Not only does adding vegetables to the Christmas dinner add vital vitamins and minerals, it adds colour and vibrancy to the dish. Try cooking them in different ways, or new styles to make sure everybody eats every mouthful. Sprouts are a common dislike at Christmas, one of the most complained about things around the dinner table, so why not try doing something different with them? Cooking the sprouts like normal, but then frying little squares of bacon until crisp, adding to the sprouts when cooked. If you are feeling adventurous try cooking the bacon in maple syrup, giving the whole dish a sweet flavour. As weird as it sounds it is delicious! If you can’t bare to even try sprouts, try roasting carrots and parsnips in honey, making sure they are crisp at the ends. Simple but very tastey! John’s joke of the day! Anglian Home Improvements specialize in double glazed products. Visit our website for information on our products.